Tyrus Raymond Cobb was an American Major League Baseball outfielder. He was born in The Narrows, Georgia, a small rural community of farmers that was not an official city or village at the time. Cobb spent 22 seasons with the Detroit Tigers, the last six as the team's player-manager, and finished his career with the Philadelphia Athletics. In 1936 Cobb received the most votes of any player on the inaugural Baseball Hall of Fame ballot, receiving 222 out of a possible 226 votes. 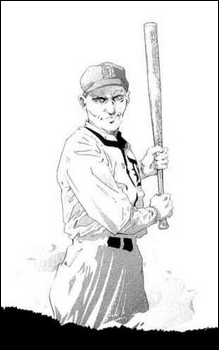 Cobb is widely credited with setting 90 Major League Baseball records during his career. He still holds several records as of 2013, including the highest career batting average (.366 or .367, depending on source) and most career batting titles with 11 (or 12, depending on source). He retained many other records for almost a half century or more, including most career hits until 1985 (4,189 or 4,191, depending on source), most career runs (2,245 or 2,246 depending on source) until 2001, most career games played (3,035) and at bats (11,429 or 11,434 depending on source) until 1974, and the modern record for most career stolen bases (892) until 1977. He still holds the career record for stealing home (54 times). In his career, Cobb played 3,035 major league games (fifth highest all-time) and committed 271 errors, the most by any American League outfielder. Cobb's legacy as an athlete has sometimes been overshadowed by his surly temperament and aggressive playing style, which was described by the Detroit Free Press as "daring to the point of dementia." Cobb himself wrote shortly before his death, "In legend I am a sadistic, slashing, swashbuckling despot who waged war in the guise of sport." Cobb was notorious for sliding into bases feet first, with his spikes high. Since his death, his legacy (which includes a generous college scholarship fund for Georgia residents, funded by his early investments in Coca-Cola and General Motors) has been tarnished by allegations of racism and violence. But the reputation of Cobb as an extremely violent man was fanned by sportswriter Al Stump, his first biographer, whose veracity has been called into question, while Cobb's views on race evolved later in his life.